Based on our trip, these are some of our findings. Here is my link on a potential long weekend itinerary in Belize. The initial plan was to head to the Blue Hole on Sunday. There are supposedly only 3 companies that actually have trips to the Blue Hole. All other companies refer people to these companies. Upon arrival, we found that there wasn’t anyone traveling on Sunday and would need to wait until Monday. We found out that there are manatees in Belize. 6 months of the year the manatees reside in the mangroves and the other 6 months they make there way out towards the reef to feed on the sea grass and mate. 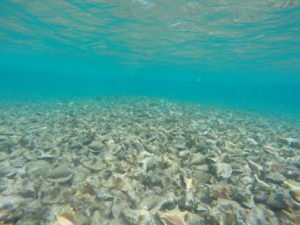 It is possible to do manatee trips that will cost >$100 or a manatee trip part of broader tour. It is not a guarantee to see them. We heard there is roughly 50% chance to see them. We unfortunately did not see them on our trip. In Ambergris Caye, there are three clubs with the Jungle Temple being the most popular. All of the three clubs are in the central part of San Pedro near the water taxi departure. The crowd in the clubs have a number of locals as well as foreigners. Caulker Caye is a little more sleepy than Ambergris Caye despite having more young foreigners. 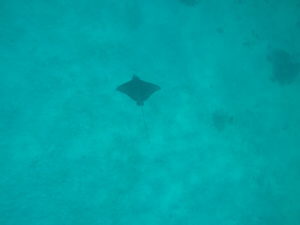 Since we weren’t able to go to the Blue Hole, we ended up going on a snorkeling adventure that covered Manatees, Hol Chan, and Shark Ray alley for $110 (plus $40 in fees). Despite not seeing the Manatees, we really enjoyed the trip. My friend ended up adding a dive for another $45. We saw nurse sharks, sting rays, and a turtle all within 3 feet of water. It was very intense. The fisherman empty the shells of conch here creating a conch graveyard. I found out that until the late 1970s that Belize use to the largest exporter of conch in the world. 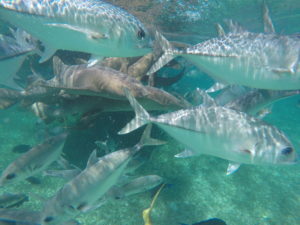 Nurse shark feeding frenzy it very intense. I highly recommend it. 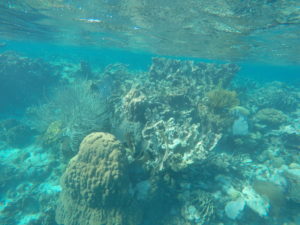 The coral was the most beautiful at the reserve. In addition, there is tons of sea life. 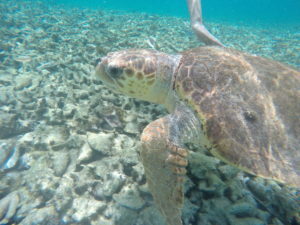 We saw a green turtle, eagle manta ray, lots of fish, groupers, eels, etc. Belize has a fixed exchange rate with the USD (1 Dollar = 2 Belize Dollars). As a result, it is feasible to use Belize Dollars or US Dollars in Belize. Being a beach destination, the prices were fairly comparable to the US. I would not expect to be saving a lot of money. In addition, Belize puts taxes on everything. You should be on the lookout for speed bumps when driving on the highway. There is always a speed bump near schools. We found out that there are only 18 certified guides and the maximum number of people per guide per trip is 8 people. In the high season, some of the groups will try to do a trip in the morning and another one in the afternoon. The maximum number of individuals allowed to go on the trip per day is between 120 and 140. (Forget the exact number) As a result, it is critical in the high season to make a reservation. There are no guides waiting at the gate. It is true that no cameras are allowed. We went with Mayawalk, who has 4 guides. Pacz Tours is another one of the groups. When traveling in Guatemala to see Tikal, it is critical that you exchange your money into the local currency. We rented a car to drive to Tikal. To get the paperwork allowing you to drive across the country, you will need to pay $25. We paid this fee to Crystal Auto. There is a departure tax of $18.75 per person. You also need to pay a fee for vehicle paperwork, fumigation, toll-fee, etc. that is 160 Quetzal (~$23) to cross into Quatemala and $5 USD to travel back into Belize. The roads are pretty good in Belize and even better in Guatemala. While most rental cars only offer SUVs, it is feasible to drive on the roads with a sedan. However, you will need an SUV if you are driving down to ATM. Since we hired a private guide, we ended up meeting the guide in San Ignacio and drove him to the park entrance. We had to cross a river and would not have been possible in a sedan.